What is a .unx universe? When you publish/create a universe using the information design tool, which compiles the business layer, the data foundation, and the connections into a single universe file with a file name of <universe name>.unx. This is called a .unx universe and UNX universes are also referred as common semantic layer (CSL). Universe created / Published using Information Design Tool (IDT) has below resources. Below is the UNX conversion features summary. @Script – @scripts are used to recovers the results of an executed script which is created in the XI3.1 Desktop Intelligence reports. Desktop Intelligence does not exist in SAP BO BI4.0, so there is no need for this function. Strategies – Custom strategies (universe Parameters) are not supported in .UNX universes. Parameter (Customization) – Customization to SQL generation parameter settings in the PRM file or in the universe parameters are not converted. You can add customized values to the converted PRM file, and customize universe parameter settings in the converted universe using the Information Design Tool. Stored Procedure Universe – The conversion is not supported. BI4.0 UNX does not support stored procedure. The workaround is to use UNV if you need Stored Procedure. Universe based on a Data Federator source – The conversion is not supported. 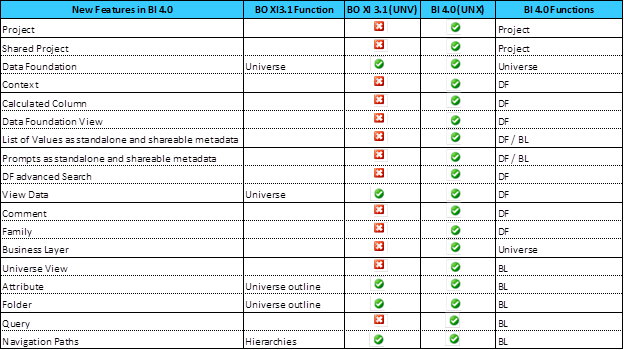 The workaround is to create the BI4.0 multi-source universe with IDT tool against the same data sources. In that way you will leverage Data Federator embedded into BI4.0 platform. Business Views – The conversion of Business Views created with Business View Manager XI 3 is not supported. Javabean Universe – The conversion is not supported. The workaround is to create BI4.0 UNX universe with IDT tool by using Java Beans middleware. Linked universe (core and derived) – A core universe is converted like any .UNV universe. The conversion of a core universe does not trigger the conversion of the derived universes that depend on it. A derived Universe is converted via the “Convert from CMS” path. When you convert a derived universe, the conversion automatically includes all core universes that the derived universe is linked to. You do not need to convert the core universes ahead of time as a separate step. The data foundation of the converted universe contains all the tables and joins from all core universes and any tables, joins, or contexts that were defined in the derived universe. The business layer contains all classes, objects, and conditions from all core universes including the classes, objects and conditions that were defined in the derived universe. Web Intelligence reports – No impact on migrated XI3.1 Web Intelligence reports (still linked to the .unv universe). You have to edit and manually point Webi reports to UNX in order for them to become BI4.0 Web Intelligence reports. Crystal Reports – The conversion of UNV universe to UNX universe will not impact migrated CR. CR 2008 consuming RDBMS or UNV data on XI 3.1 gets migrated as CR 2011 consuming RDBMS or UNV data on BI4.0. The migrated XI3.1 CR are still pointing to the original data source (RDBMS or UNV universe).Conversion of CR 2011 to CR for Enterprise is done through a wizard “Connect to the Common Semantic Layer” which open automatically if CR 2011 is open with CR for Enterprise. Desktop Intelligence reports – The XI3.1 Desktop Intelligence reports are not supported in SAP BO BI4.0. They have to be converted to Web Intelligence report and complete information can be found here. How to convert UNV to UNX? Option 1: The CMS repository -recommended for converting a Universe along with its security items (Method 1 – using Upgrade Manager Tool & Method 2 – Using Information Design Tool). Option 2: The file system -allows you to do a conversion of a UNV file that was saved for all users (using a shared or personal connection) (using Information Design Tool). 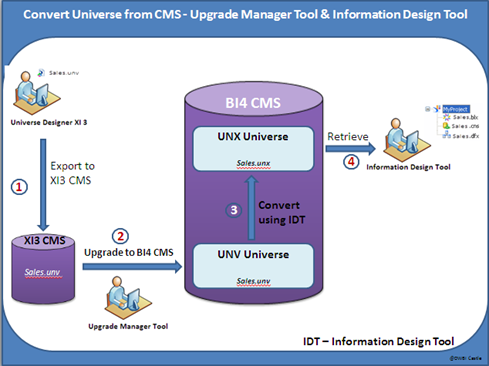 We can use Upgrade Manager tool to move the XI3.1 CMS content to the new BI4.0 CMS repository and then convert UNV universe to UNX universes using Information Design Tool (IDT). 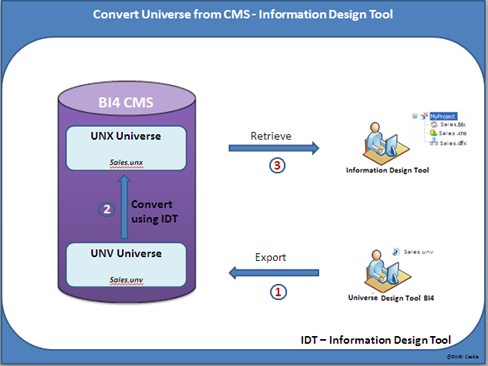 We can use Universe Design Tool BI4 to export a UNV Universe into the BI4 CMS repository. That UNV Universe can then be converted into a UNX Universe using Information Design Tool. 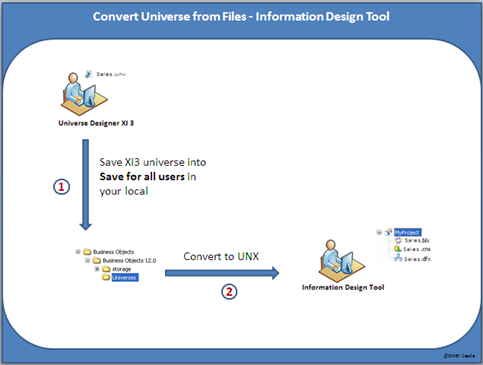 Information Design Tool allows you to convert a UNV universe file without requiring a CMS. • After converting the universe, do integrity check and refresh universe structure to get updated structures and verified the tables. • Validate the access restriction Information Design Tool. • Test and validate the universe connection in Information Design Tool. Aggregate Navigation is used to define incompatible / compatible objects for Aggregate Aware function. Please visit below for more details. Can you talk about how to convert crystal reports to SAP BO universe? What you are trying to achieve by converting Crystal reports to BO Univerese? If your crystal reports created by stored procedure you can convert them into BO universe drives tables and then use. Please explain in detail what is requirement. My crystal reports are not created by stored procedure. Several data fields were calculated and formatted in crystal reports because the database itself doesn’t have the needed data fields. We are retiring crystal reports, need to move all the crystal reports into Business object universe. 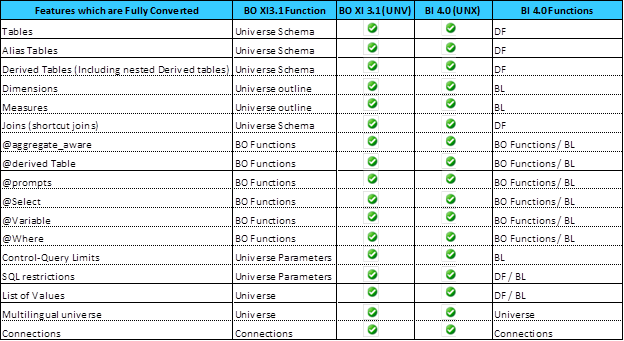 you can create BO universe bu inserting the required DB tables into BO universe structure and create the required objects using BO universe designer. In the object creation you can perform all your logical calculation & etc., and then create the reports. 1.How to upgrade from 3.1 to 4.0 by using Import Wizard?. 2.After upgrade from 3.1 to 4.0 ,universes will be changed from .unv tob.unx, now what happened either we have to create from scratch or else we can use it? 2. It’s not mandatory you have to convert the universe from unv to unx. It’s purely depends on your requirement and check the post for how to convert unv to Unx for more details. My doubt is while upgrading from .unv to .unx the entire universe will be upgraded to .unx or there will be some issues? Hi Venkat, you don’t need to create the unx universe from scratch and some of the features are changed / updated in unx and those items you verify in this post. I got assigned for a new SAP BO Implementation Project, i need to create universe from scratch.it is a good learning for me.Can you please suggest some dos and donts. what i need to take care.